I had this fantastic sent to me by Carlos from the Lambretta Club of South Africa, (thanks Carlos!) It’s of a couple of French guys (although I think they actually may be from the french speaking part of Switzerland, from the writing on the ‘topbox’ flag on the laid down Lammie)… on route from Lausanne to “le Cap”. The pic was taken in the Sahara! That’s quite a trip! Carlos reckons it was sometime in the ’50’s. I love their style… baggy trousers, a pair of stout brogues, beatnik beards and a nice tweed sports jacket for when it gets a bit chilly. They bred ’em tough in them days. Thanks again Carlos, and Andy for forwarding it on. If YOU have any old Lambretta shots, I’d love to see them, and post them up here. 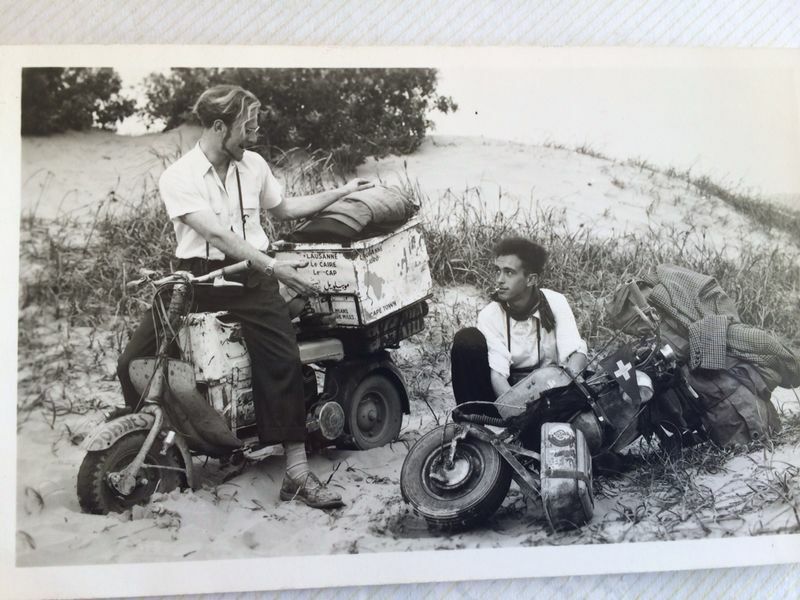 This entry was posted in Lambretta History, Lambretta Imagery, Lambretta Life, Open frame and tagged Adventure, Africa, Cape Town, France, Lausanne – Le Cap, Model D, Road trip, Sahara, South Africa, Swiss, Switzerland by crocodilejock. Bookmark the permalink.